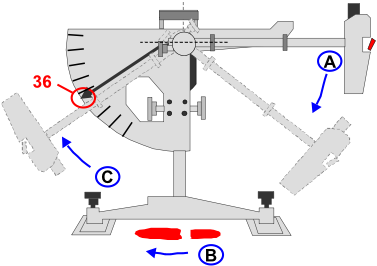 Why should you have your floors Pendulum Tested? Are you an Employer, Owner or Manager? Are you sure your floors are safe? Could they achieve a value of 36 on the HSE Approved Pendulum Test? From schools to factories, shops to offices and hospitals to airports your floors must be safe and the Pendulum Test can prove it. Your risk assessments should always be able to prove your floors meet the minimum slip resistance value (pendulum Test Value) of 36 to prevent personal injuries, costly accident investigations, injury compensation, loss of profits and personal injury claims against you. A drop of 10 points to a value of 24 will raise the possibility of slip by 10,000 times! Has a Customer, Employee or Visitor slipped on a floor like this and injured themselves but you believe your floors are safe? Do you know what Pendulum Test Value your floors will achieve? The image above shows a Terrazzo marble floor typically found in office receptions, shops and shopping centres with a normal Pendulum Test Value of 50 when dry – But only value of 10 to 15 when wet – you might as well walk on an an ice rink if there is a little rainwater or coffee spill on the floor! The HSE / HSL has calculated a Pendulum Test Value of 36 reduces the probability of slip to 1 in a million – but this must be achieved on dry floors, wet floors and floors contaminated with substances relevant to the floor environment such as blood, cooking oil, talcum powder, grease, engine oil, diesel or urine. A drop of just 2 points to 34 will raise the chances of slip by 10 times. What Floor Testing should I have done and when? FloorSlip can arrange Floor Sample Tests and / or Ramp Testing before a floor is laid. This simple action is highly recommended if you are at the stage of specifying a new floor or a floor surface type in new building and can save you many thousands of pounds for the sake of a few hundred pounds. Unfortunately, too much onus is placed on the aesthetics of a floor with too little impetus considered as to the grip potential and its ability to prevent floor slip injuries – even though Building Regulations Part M and BS 8300 Annex C are quite specific that floors will be specified to be slip resistant. If it’s a ‘turnkey’ building, make sure the flooring specifications are available and meet your requirements and you have a copy before you accept the building. Get a slip test carried out to check flooring supplied has the same slip resistance potential as floor samples tested. Flooring manufacturers changing manufacturing processes or raw material supplies can inadvertently cause changes in the slip resistance properties of the floor. Pendulum Testing will identify any shortcomings immediately. (a) Present to your insurance companies and possibly help lower liability premiums, particularly if you have had a slip accident claim in the past. Why should I use FloorSlip for my floor testing? FloorSlip only use HSE recommended Floor Testing techniques. What types of floor tests are there? to determine floor slipperiness on an inclined floor in wet, dry and contaminated floor conditions; these are generally performed off site on floor samples before a floor covering is chosen and give a variety of readings for a person wearing safety shoes or in bare feet, so floor manufacturers and those persons specifying floors can also consider, for example, what floor type is required for a swimming pool. uses a trolley rolled down an inclined ramp. Depending on how far the trolley travels when it comes into contact with the flooring surface will give an indication of heel slip and is reported to be equated to the action of a pedestrians heel slipping on a floor. are self powered trolleys that drag themselves across the floor surface, measuring the Coefficient of Friction as they move. use a weighted rubber slider, which is dragged across a floor surface to give a read out.